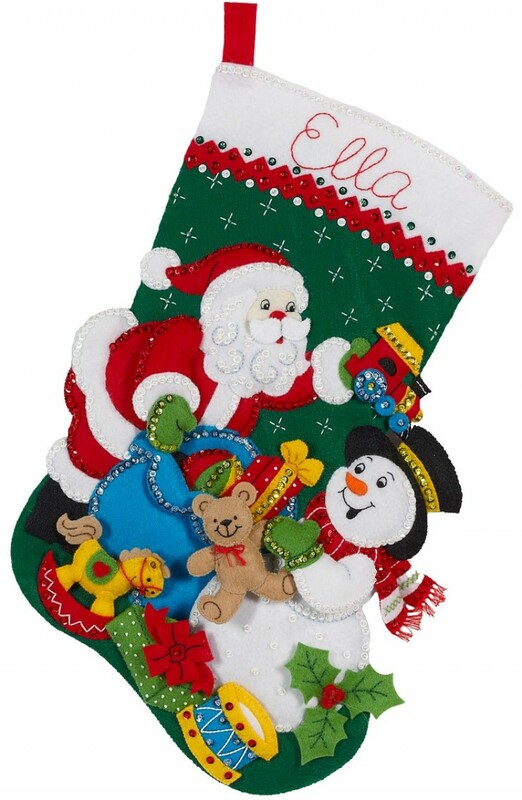 As a special Bucilla 150th Anniversary bonus, you will receive a matching ornament with some of the stockings. 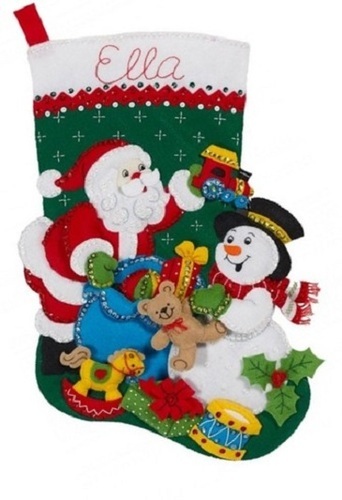 For an additional $10.00 will line the stocking in a Polysatin lining. "SANTA AND SNOWMAN" - $135.00 - Santa & Frosty appear to be busy checking the toys as they are being loaded into Santa’s Sack in preparation for the big day ahead. 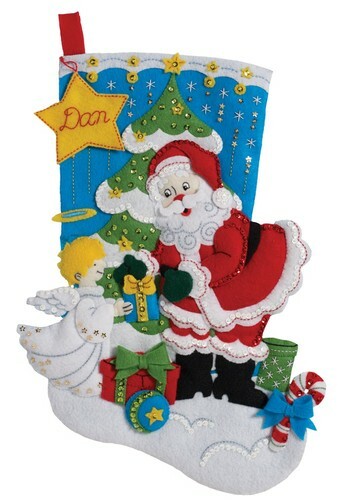 The colorful toys and gifts combined with Santa’s non-traditional blue sack and the deep Christmas green background make the characters on this kit really pop with color. "FROSTY NIGHT" - $135.00 - This Snowman is all decked out in shades of Blue and Lavender. Everything from the hat on his head and his scarf to the ornaments hanging from his Lavender stick hands and the presents at his feet follow the same color scheme. The deep blue night sky makes a perfect back drop. 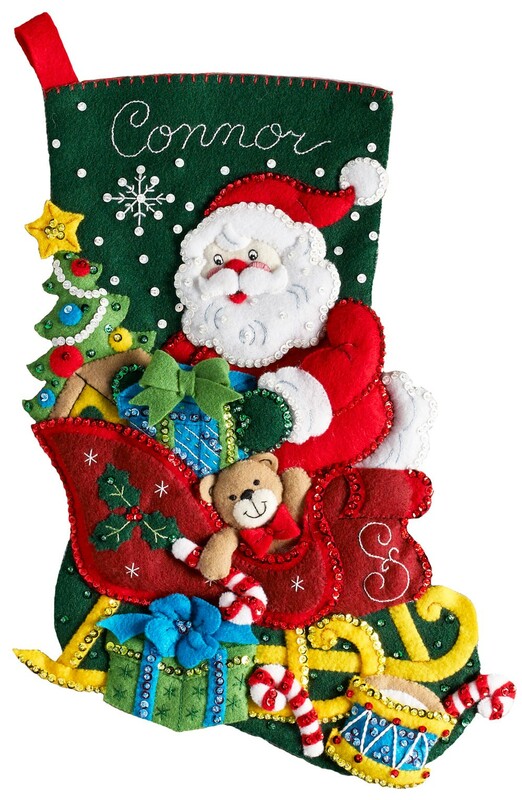 "CHRISTMAS POINSETTIA" - $135.00 - This stocking appears to be crammed full and overflowing with Poinsettia flowers but the flowers are actually a design on the outside of the top of the real stocking. "SANTA'S HELPER" - $135.00 - Sometimes even Santa needs a little extra help. One of his Reindeer is riding in the colorful sleigh with him to help deliver toys and gifts to children all over the world. "SANTA STOP" - $135.00 - Frosty the Snowman and his animal friends want to make sure Santa doesn’t miss any stops this year by making a sign that says, “Santa Please Stop Here”. The little bunny and reindeer have even brought the little blue bird’s house along to make sure Santa doesn’t forget to leave treats for the birds in their tiny little house. "THE LIST" - $145.00 - Santa and Rudolph checking a long list of Naughty and Nice to make sure every Boy and Girl will receive the right gift and no one will be left out. The list is so long that Santa is sitting on a small mountain of brightly wrapped gifts while red nosed Rudolph is checking the rest. 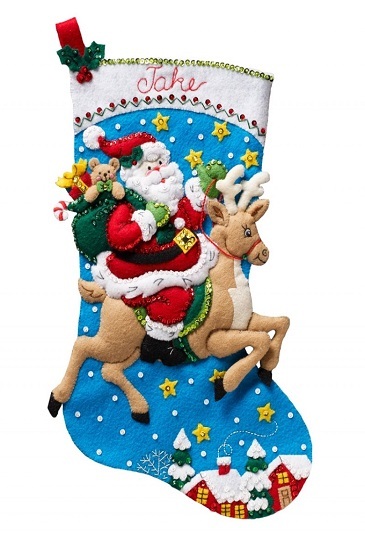 This stocking comes with an ornament. "SNOWDAY FUNDAY" - $145.00 - This stocking features Frosty, in his earmuffs, top hat and colorful scarf leading the race down a snow covered hill on his red toboggan while 2 of his Snowman friends, in their colorful hats and scarfs follow him on brightly colored snow discs. 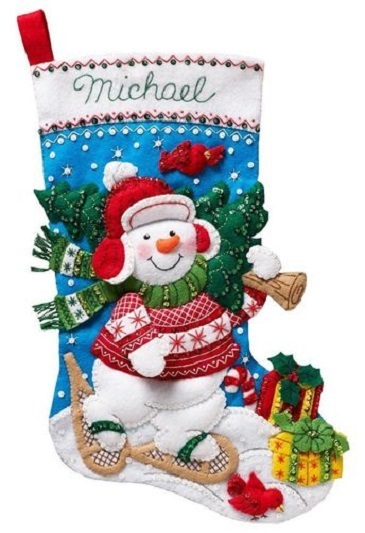 You will also receive an ornament with the stocking. 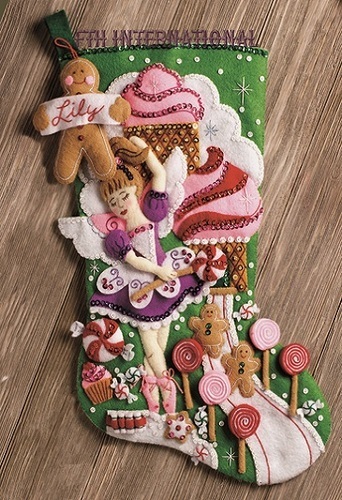 "SUGERLAND FAIRY" - $145.00 - This Stocking features a dainty fairy in ballerina slippers dancing amongst a huge assortment of Christmas treats and other goodies. You will have to look carefully to see all the treats, including cupcakes, ice cream, gingerbread men and cookies, lollipops, candies, and more. This stocking come with an ornament. "REINDEER SANTA" - $145.00 - Santa is riding a Reindeer over the snow covered rooftops below with a huge sack of toys slung over his back. 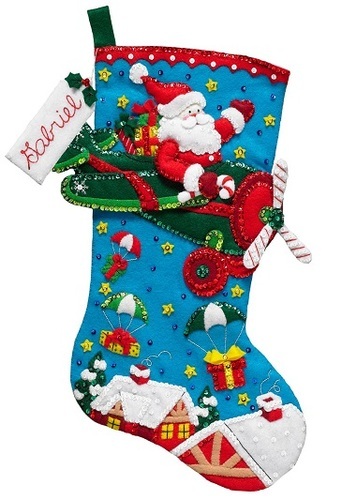 The bright colors and sparkling stars shining all around Santa and his Reindeer will really make this stocking stand out. This stocking come with an ornament. "NORDIC SNOWMAN" - $135.00 - This Snowman dressed in his fancy shirt and scarf, surrounded by presents and red birds, wearing his snowshoes, is on his way home to get ready for Christmas with a fresh tree on his shoulder and a smile on his face. 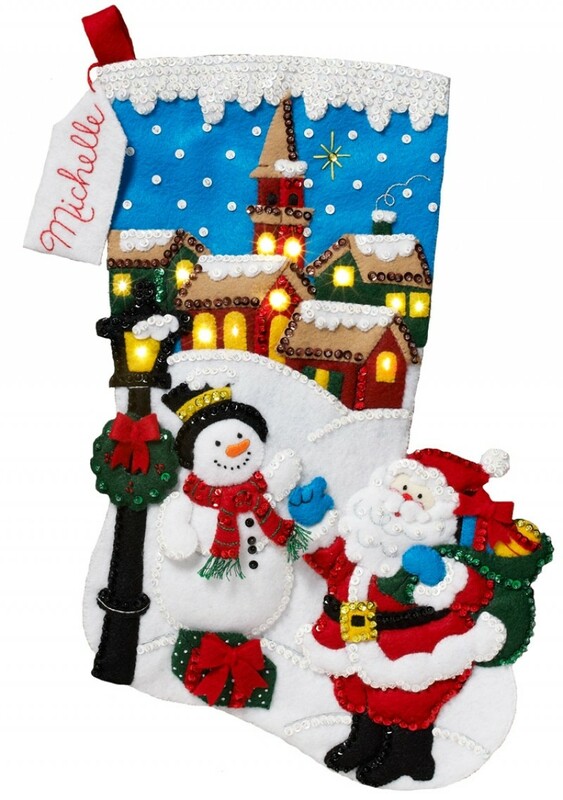 "CHRISTMAS VILLAGE" - $150.00 - This Stocking features a beautiful village scene with all the windows in the Church and other buildings shining brightly with real LED lights. Even the old fashioned street light is casting a shiny glow over Frosty and Santa’s heads as they stop in the path to the village for a friendly chat and possibly to exchange gifts. 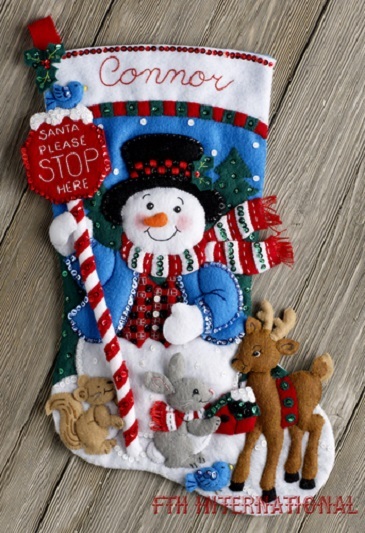 This stocking comes with an ornament. "CHRISTMAS BABY" - $145.00 - This Stocking features an adorable little baby enjoying what might well be their first sleigh ride in the snow. The Christmas red trim on the baby’s snow white bonnet and sleeper could easily be changed to blue, pink or any other color you might prefer over the red. 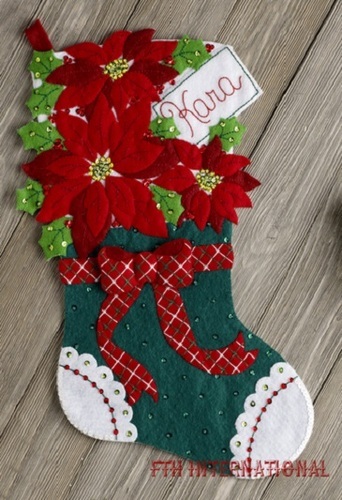 The stocking will include a green and red wreath ornament with a space in the middle for the new baby’s name and date of birth. "CHRISTMAS ANGEL" - $145.00 - A beautiful Christmas Angel dressed in a cream colored gown and Christmas red cape with gold trim. The dark blue night sky twinkling with stars is prefect for her snow white wings and golden halo. 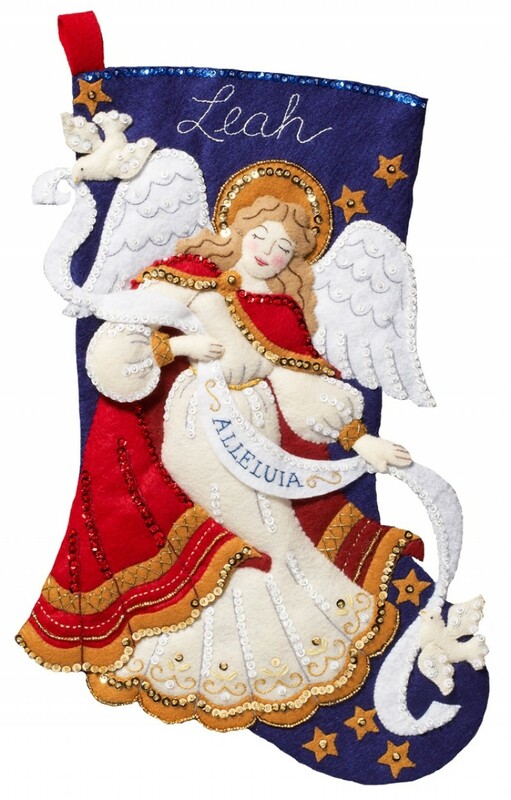 She is holding a banner with a dove on either end with the word Alleluia. An ornament comes with the stocking. "AIRPLANE SANTA" - $145.00 - Santa appears to be giving his reindeer and sleigh a rest while he soars over a village rooftops in a fancy Christmas red and green airplane, loaded down with presents. He is dropping them amongst the stars by parachutes to all the good boys and girls. A ornament will come with the stocking. 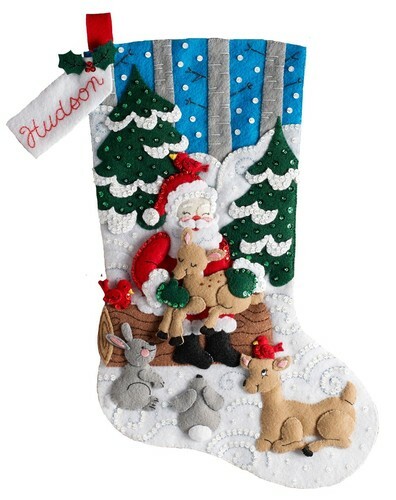 "SANTA'S FOREST FAMILY" - $135.00 - Filled with adorable forest animals, including rabbits, deer, and red cardinals, this stocking will be treasured by any new family member. "SNOW MUCH FUN SNOWMAN" - $135.00 - This beautiful snowman is surrounded by adorable little critters. 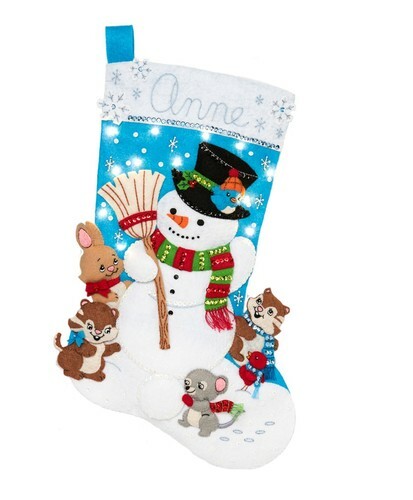 This stocking has chipmunks, a rabbit, birds, and a mouse. 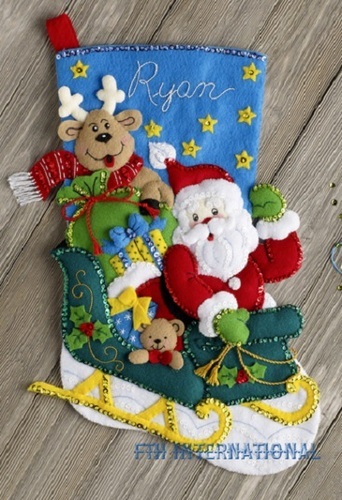 It is the perfect stocking for a new little member of your family. 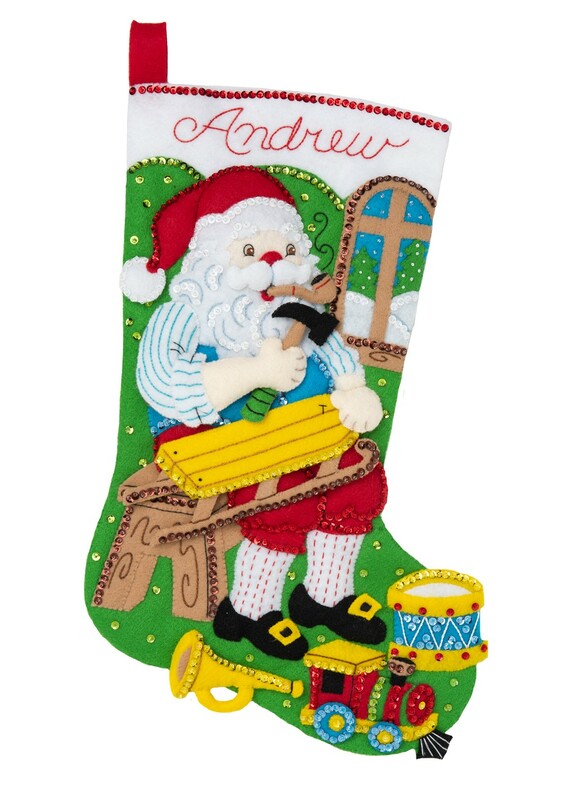 "WOODWORKING SANTA" - $140.00 - AVAILABLE LATE SPRING 2019 Handyman Santa builds a sled. 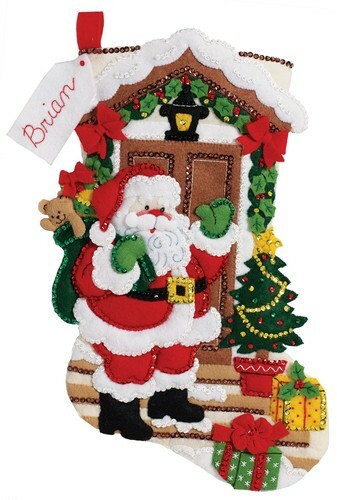 "SANTA'S HERE" - $140.00 Santa is at the doorstep, with his bag full of toys and Christmas presents on Christmas Eve. 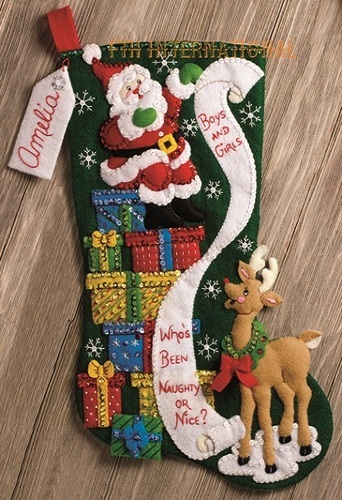 This stocking features a classic Santa Claus and so many wonderful details. From the snow-capped roof, to the tiny Christmas tree on the steps, this stocking is sure to please any member of your family. Lights in the garland and lamp in the design really glow. "SNOWMAN FAMILY OUTING" - $135.00 - A snowman family of four are out on the ice for some skating. You'll enjoy bringing these jolly little snowmen to life, with their funny expressions and cute details. 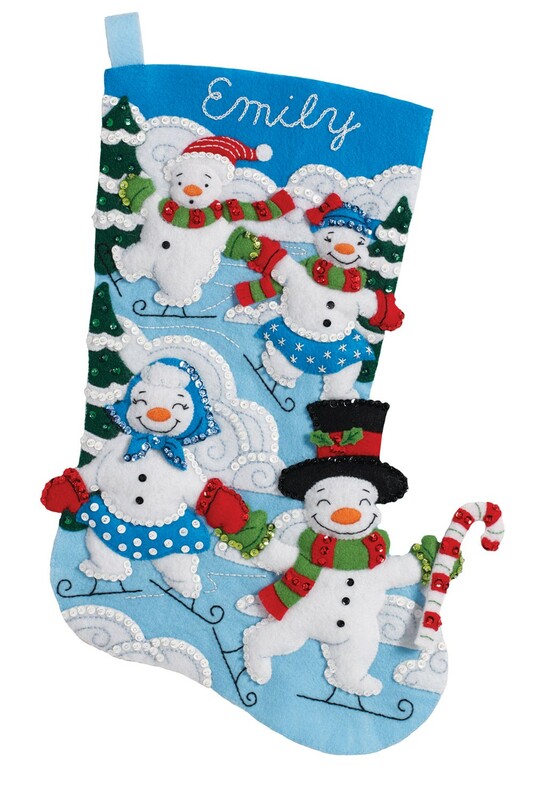 It is a perfect stocking for a family, a mother, or a new baby. 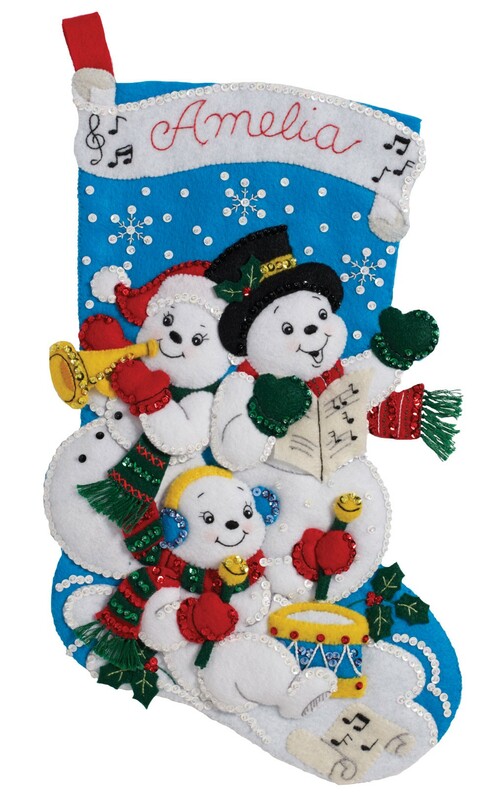 "SNOWMAN FAMILY BAND" - $135.00 - This jolly snowman family is ready to sing and play your favorite Christmas tunes. Mom is playing a trumpet, baby is playing a drum, and dad is the lead singer of this band. Full of musical notes, this Christmas stocking is perfect for any music lover in your family. "SANTA'S GIFT TO ANGEL" - $ 135.00 - Perfect for the angel in your family, the Santa's Gifts to Angel is Santa delivering gifts to a sweet angel. 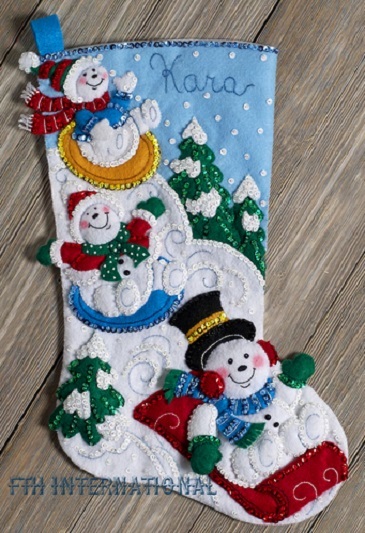 The design has a Christmas tree decorated in gold, presents wrapped in bows, and a star tag to personalize the stocking.